Welcome to Punch-It Entertainment and the Battle for Sularia! We're excited to be partnering with you to bring our game to your store for both its ability to generate retail sales, and as a vehicle to strengthen the gaming communities you already host and enjoy. That's the #1 priority behind what we're doing here at Punch-It Entertainment, fostering networks of game stores for players to plug-in for an amazing organized play and social experience. It's all about great gaming, and the positive impact it creates! So, what is Battle for Sularia and what's a stronghold? Battle for Sularia is a 20-minute head-to-head Battle Card System game that uses dual resource management and pits fearsome combatants against one another. Strongholds are legendary sites and the homes of heroes for our various factions, and it is also our term for partner retailers who sell and host our game like you! Ok, great. but I've never heard of a battle card system game. That's because it's our proprietary "expandable" or non-collectible card game system model which challenges players to create a deck with our 60/90 construction system, manage two resources, establish a domain of sites, and deploy combatants in order to gain victory on the table top. An Expandable card game, so no random booster packs? Exactly. Each of our card product offerings includes a full four copies of each card released in that starter kit or expansion. We offer a starter "Battle Kit," which features two pre-constructed play decks and the remainder of the 180 cards in the set. Future releases will include expansion or "Command" and "Faction" packs, which will offer complete four-copy playsets of each card in that release as well. No randomization, and no gimmicks, each product gives you what you need to expand your game or play today with a single purchase! Tell me more about this "Battle Kit"
The Battle Kit: The Battle Begins contains 21 unique Jotune cards, 21 unique Synthien cards, and 3 unique Mercenary cards, with a complete four-copy playset of each for a total of 180 cards. Inside the Battle Kit we include two pre-constructed play decks, one for the genetic super warriors of the Jotune and one for the robotic menace of the Synthien, that are ready to play straight out of the box. The remainder of the set's cards are included for players to further customize their decks and create unique strategies of their own! Yeah, you mentioned a 60/90 construction system... intriguing. We certainly think so! When creating a deck, a player is restricted to a minimum of 60 cards in their deck, with no more than four copies of any given card, and no more than 90 construction points used. Each of our cards has a construction value from 1 to 4. This gives added value to cheaper construction cost cards and creates some very interesting choices when building a deck. Sometimes a weaker card is chosen so that other more powerful cards can be included and the construction cost requirement is still met. This is a layer of strategy we believe that will really resonate with table top miniatures players for its "list building" quality! Wow, ok, that is innovative. what kind of cards can i expect? There are four types of cards in the Battle for Sularia: tactics, conditions, sites, and combatants. A player has the opportunity to craft a strategy that uses any number and mix of these types, but at the core of our game is gaining influence each turn, creating a domain of multiple sites, deploying combatants to the table top, and using tactics and conditions to outmaneuver their foes. If you would like to know more about how each card type works, how they function, and where they'll go on the table top, I highly recommend checking out our series of game play articles and how-to videos. A tactic, condition, site, and combatant card in the Battle for Sularia. In addition to our card products, we have a range of stylized playmats showcasing the stunning art of Sularia and which also include our game's play zones lightly outlined. Our playmats are manufactured using the highest quality manufacturing processes, which puts vivid color onto a high-grade polyester and rubber pad, and are 100% gentle-machine or hand washable. THE BATTLE KIT LOOKS GREAT, BUT DO YOU HAVE ANY EXPANSIONS PLANNED? Absolutely. We have expansions planned for every 60-90 days after our first expansion product releases in late June - July; which is Command Pack: Blood, Profit, and Glory, a small product expansion. For more info about Blood, Profit, and Glory, its cast of characters and exciting new mechanics, check out our official press release! I'm sold, what's the next step and how do I place an order? We're glad you are! Please fill out the order request form below and submit it to us. We'll get back to you about our current product offerings and pricing, how to place your first order, how to place a re-stock order, and details about our currently available promotional items. In the meantime, be sure to browse the rest of our site www.sularia.com, learn about the world, see the cards, and hear the buzz we're generating in the gaming community! Thank you for contacting us! 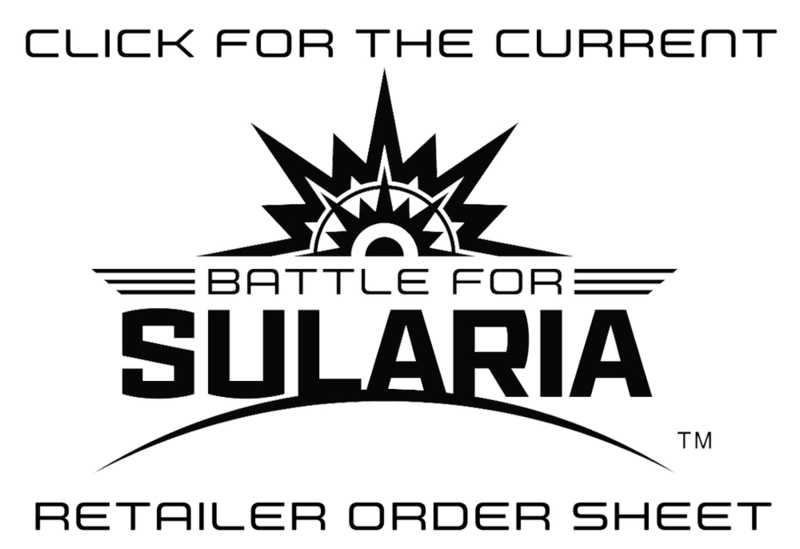 We're excited to be working with you to bring Battle for Sularia to your game store. Jesse Bergman has received your request and will get in-touch with you shortly and will make sure you have all the information you need about our products and placing an order.